Wind and weatherproof cotton parka in two timeless colours with enchanting swan embroidery on the mid back. This comfortable coat is a timeless favourite that unites functionality and feminine details. This lovely warming piece features an 8000 mm water column, raglan sleeves, large flap pockets and comfortable elastic on the sleeves. A drawstring was added to the waist and hem so the fit can be adjusted to optimise comfort while wearing, and it's a pretty eye-catcher thanks to the colour-contrasting Vichy checks, too. 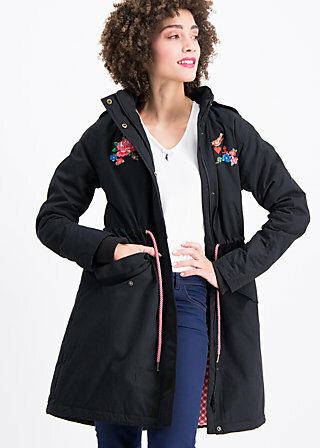 The parka's hood is made from water-repellent material with a luxurious rose pattern and can be stowed in the collar. Cuddly teddy-bear lining in the upper part and a colour-contrasting Vichy fabric in the lower part of the inner lining round out this outdoor gem that shines with a concealed snap-button placket and additional zip. The multi- coloured rose embroidery at breast height and a pair of swans bursting with love (of detail) complete this strong Blutsgeschwister model. A heroine's journey is long, and her treasure chest is filled with precious memories like this magnificent souvenir of a coat. The swans I fed butter bread to as a child, the embroidered roses from a trip to Budapest, my Teddy Bear from nursery days, now a warm plush for my back, those homey curtains from an Alpine chalet... and, as if all that weren't enough: this loyal companion is also weatherproof! The fabric “black-society” can be easily combined with those fabrics.